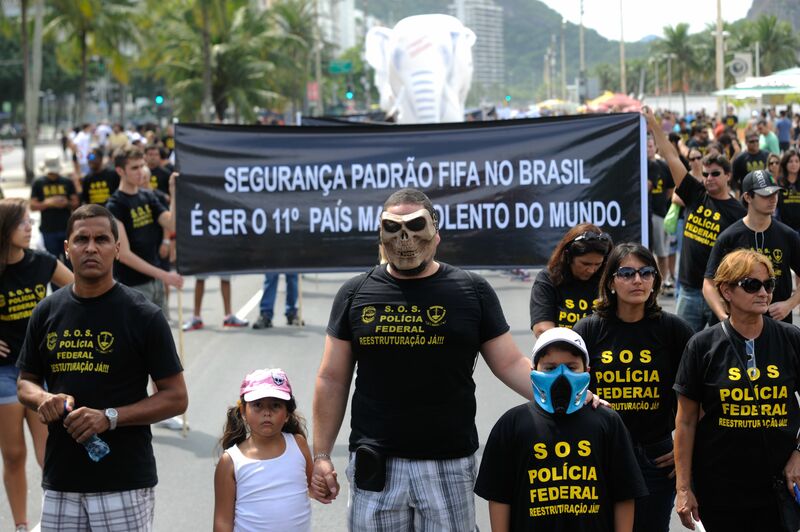 SAO PAULO, BRAZIL – Federal police in Brazil staged a protest on Rio de Janeiro’s Copacabana beach on Sunday, April 13th, calling for better working conditions, higher wages and restructuring of their career paths. The group vows to strike during this year’s FIFA World Cup tournament, which will be held in twelve cities across the county, and runs from June 12th to July 13th. photo by Tomaz Silva/Agência Brasil. Close to two hundred agents, registrars and fingerprint specialists from the professional services of the federal police marched on Rio’s Avenida Atlântica to contest, what they deem, a “failed” public safety system on Copacabana on Sunday. André Vaz de Mello, the president of the Union of Servers of the Federal Police Department of the State of Rio de Janeiro, said, “We will wait until the World Cup, but we stand with Brasília’s and the other states’ proposal: stop [working] during the World Cup, mainly at airports,” according to Agência Brasil. Besides investigating crimes against the federal government, the federal police play a key role in airport and border control services. They are in charge of issuing Brazilians’ passports and conducting border control enforcement at frontiers and airports across the country. “Unless [the government] opens the gates and lets in terrorists, fugitives of law and all. It’s the government’s call, if it wants to maintain safety during the World Cup or open the gates,” threatened Vaz de Mello, as reported by online portal G1. Vaz de Mello explained to Agência Brasil that the the federal police’s protest in Copacabana on Monday was meant to spotlight the federal police’s precarious working conditions. He threatened a strike if the federal police’s demands are not met before the international tournament, while promising to maintain “essential” services. Deemed the “March of the Elephants” after the five oversize white inflatable elephants the police officers carried on the streets, the demonstration aimed to raise awareness of the inefficiencies of the police’s current model. “The white elephant is the inefficiency of our current public safety model, in which 96 percent of cases do not go anywhere, and only two percent truly punish those guilty for them. This [model] does not exist anywhere else,” Vaz de Mello said. In 2009, a delegate from the Rio Grande do Sul state police estimated that around eighty percent of the cases brought to the federal police are not solved. This is partly due to the fact that the number of federal police investigations has risen by 2,000 percent in the last twenty years, according to data from Brazil’s Court of Auditors. In 2003, the federal police opened 50,220 investigations and two years later, in 2005, there were 66,492 cases. “We ask for a restructuring of the career, with the attributions of roles such as fingerprint specialist, agent and registrar defined by law, because there is not that at the moment and at the very least, an inflationary readjustment [of salaries] so we can sit and talk,” Vaz de Mello said. According to him, federal police officers have not received a pay raise in seven years. In November 2013, the professional categories of the federal police, defined as those that serve as registrars and fingerprint specialists, staged strikes and protests to demand better salaries. Federal police delegates receive salaries that range from R$16,000 to R$22,000 per month, while those serving as professionals in the federal police, make R$7,000 to R$11,800 per month.